On February 9th I traveled to Guatemala City as a physician/resident, with a surgical team from Healing the Children, Northeast- a Connecticut based, non-profit, non-partisan, volunteer organization; its purpose is to help children throughout the world receive medical care unavailable to them due to a lack of medical and financial resources or health insurance. Our relatively small team consisted of a Urologist, ENT specialist, oral surgeon, 3 Anesthesiologists, 2 nurse anesthetists, several scrub technicians, OR nurses, a few critical care nurses, 2 pediatricians, an ER doc, a Cardiologist, and me. We arrived on Saturday in Guatemala City and were promptly introduced to members of our sponsor organization- Fundacion Pediatrica Guatemalteca. They guided us to the hospital Unidad Quirurgica Nino Jesus where we dropped off nearly 50 duffle bags stuffed with our medical gear; we'd even packed a bulky surgical microscope which amazingly survived the trip. Sunday was designated as the screening day. This was conducted in a clinic separate from the hospital. Roughly 70 children were screened for various surgical and dental procedures, including tonsillectomies, cleft lip/palate repairs, and simple tooth extractions. Many kids arrived, bright and early, with parents, siblings, and even grandparents. My role was to assist in the recovery room along with the pediatricians. We wrote post-op orders, discharge instructions, mixed antibiotics, provided pain medication, and, most importantly, passed out stickers, tattoos, and stuffed animals! 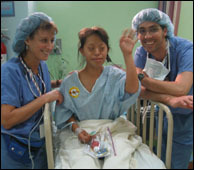 By the end of the week, our surgeons and dentist performed and completed 57 successful cases. Follow-up care for each of the children was carefully coordinated through our Guatemalan sponsor organization. By Saturday, we were gone. The experience was truly incredible. I thoroughly enjoyed working with the children and their families and learning about their unique culture. Many thanks to the Benjamin H. Josephson, MD Fund for supporting me on this trip to Guatemala!